Yes, it took me this long to read it 😛 Deal with it, lol. What I really liked about the book was the world-building. I found it a very nifty world view, the factions and the dynamic between them was what really got me into reading it in fact – I read somewhere an interview with the author and that factions concept was the hook. Would I have read the book if it hadn’t been for that concept that got me so intrigued? Probably not. I live in a dystopian enough place myself to want to find others of the sort, lol. But I’m a sucker for new ideas of social order, probably has a lot to do with being a sociologist. I will not make this into a social order thesis or something, but Veronica Roth came up with a really smart concept; I loved it, in fact. It was a lot of fun reading about the factions and especially the tensions between them. I felt there was also a lot to be considered after reading, it leaves you with something to really think about – there’s nothing better or more a book can do for you. Aside the momentary pleasure, the thrill ride, the fun & entertaining, a good book has spirit, it has an idea, it has a message. I felt there was plenty of that in Divergent, I felt it provokes introspection and it calls for assessing or reassessing your values, your goals perhaps, your inner workings. This was by far my favorite part of this novel. The characters were interesting, but I wouldn’t say I was totally into one of them; more like I liked peeking in on their reactions and behaviors, something like a social experiment. I think the plot appealed so much to my scientific mind that it also brought on a distinctive reaction: detachment from the subjects of my study. Did I find Tris and Four to be a cute couple? Perhaps; but watching the Dauntless initiates react to the simulations forcing them to face their fears and how they each reacted to it? Priceless. 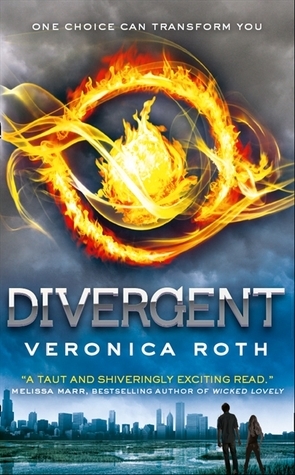 The writing was clear and very accessible, it gave good perspective on not only Tris but everyone around, and I find in this a great plus; it takes real talent to give a world view through a character’s eye, as human beings we tend to focus on what interests us directly, and that’s not always a wide horizon, if you catch my drift. Perhaps because Tris had been educated to be oriented outward because of the Abnegation culture the outward focus makes so much sense and feels so natural – this as well is a great success. I will admit to having found a couple of quotes that I had a total crush on, one of them being a scene between Four and Tris, the one with the fear thing and how it wakes her up? You know what I’m talking about, I’m absolutely sure xDDD Perhaps it makes me a bit of a twisted reader, but hey, it takes all kinds to make the world keep going, right? Was I totally hooked? I was; I staid up all night and read it in one go, yes. Was I fangirling when I was done reading and during? No. I was entertained, amused and intrigued, but I wasn’t fangirling. I blame it on my scientific mind being too alert, lol. I can’t be scientifically curious and fangirling at the same time, I just don’t have it in me. Plus, it’s the YA syndrome again – had Tris been a more mature character, and had her relationship to Four been on the grown-up-ish side, I would have been fangirling most likely. Sorry, it’s just how I feel. Great review, Livia. I loved every bit of this book, and it was the concept that sucked me in. I like the way Tris pay attention to details. Love her voice especially. I gave the book a 5-Star! I’ll be reading Insurgent next. Thanks! I’ve been planning and plotting to read Insurgent for like months, yet still didn’t get to it. That concept is genius, isn’t it? I so love smart, original concepts. Planning and plotting to read Insurgent? Well, that’s because you have so many books to read and you must def love reading. I just stalked back on Twitter. I checked Goodreads but we’re friends already. I saw a surprise there, though: 585 read! And Currently-Reading 3! That’s great, but it makes me wonder if you ever have time to write? Well, since you’re a readaholic I might as well ask for a book recommendation. I want to read more Dystopian. I enjoyed The Hunger Games Trilogy. You know any good Dystopian that has a male protagonist? Original concept book? I do have time to write only because I schedule it in, lol. I write when I’m inspired, and in those moments I couldn’t do anything else even if I wanted. I just got Legend by Marie Lu. The story is told from the POV of a male and female character. I hope to read it when I’m done with Insurgent. Don’t laugh, but Legend is one of those many many books I wanna read, like one of those almost 600. Sigh. Someday, I tell you, someday I’ll manage to get to it too, lol. I’ve read really good things about it from book bloggers I follow, so I think it’ll rock. Maybe I need to put it in my weekly RAWBl schedule, it’s the safest way right now to stick to a reading schedule, lol.